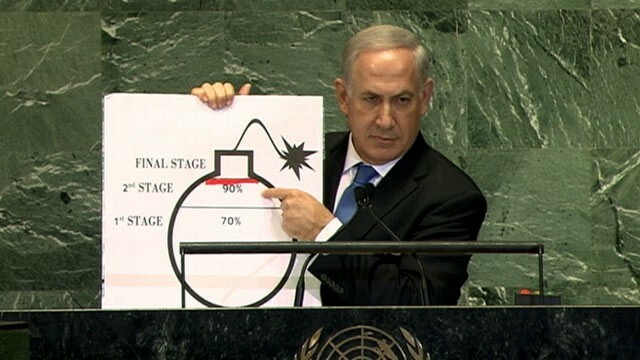 Israeli Prime Minister Benjamin Netanyahu really likes using visual aids. In laying out the perennial threat of an ever-imminent, terrible, horrible, no good, very bad Iranian nuclear bomb that will set the stage for a second Holocaust with the deftness and finesse of a third-grade show-and-tell artist, Netanyahu has brought to the podium Xeroxed copies of old letters, meeting minutes and, now, a dazzlingly crude drawing of a cartoon bomb to illustrate this fearsome inevitability. If we're lucky, perhaps he'll bring a geode to Herzliya next year. NETANYAHU: Last month, I went to a villa in a suburb of Berlin called Wannsee. There, on January 20, 1942, after a hearty meal, senior Nazi officials met and decided how to exterminate the Jewish people. The detailed minutes of that meeting have been preserved by successive German governments. Here is a copy of those minutes, in which the Nazis issued precise instructions on how to carry out the extermination of the Jews. Is this a lie? NETANYAHU: A day before I was in Wannsee, I was given in Berlin the original construction plans for the Auschwitz-Birkenau concentration camp. Those plans are signed by Hitler’s deputy, Heinrich Himmler himself. Here is a copy of the plans for Auschwitz-Birkenau, where one million Jews were murdered. Is this too a lie? NETANYAHU: Some commentators would have you believe that stopping Iran from getting the bomb is more dangerous than letting Iran have the bomb. They say that a military confrontation with Iran would undermine the efforts already underway; that it would be ineffective; and that it would provoke an even more vindictive response by Iran. I've heard these arguments before. In fact, I've read them before - In my desk, I have copies of an exchange of letters between the World Jewish Congress and the United States War Department. Here are the letters. 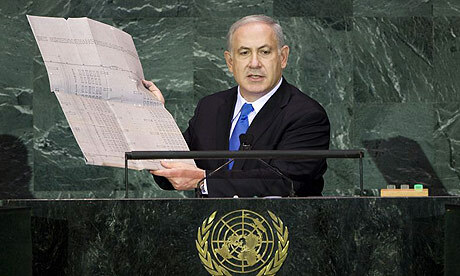 NETANYAHU: In fact, the only way that you can credibly prevent Iran from developing a nuclear weapon, is to prevent Iran from amassing enough enriched uranium for a bomb. So, how much enriched uranium do you need for a bomb and how close is Iran to getting it? Well, let me show you. I brought a diagram for you. Here's the diagram. This is a bomb. This is a fuse. Netanyahu's comments at the UN would be comical if the reality of a war were not a serious possibility. He is rightly getting crushed in the US media, but more importantly he is also getting enormously bad press in Israel. This is a good thing. He needs to lose power and is obliging by making statements that are simply not true. 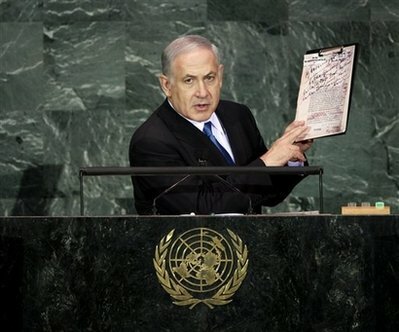 For peace in that region, specifically regarding the Palestinian plight and the potential conflict with Iran, Netanyahu can not be the voice of Israel. That said, I would also argue that Ahmadinejad also needs to lose power. He is also obliging, but perhaps not fast enough. With Mashaal not seeking re-election, we could see three new leaders in the not so distant future. I may be overly optimistic, but this could be a very real chance for peace. re: Wannsee: "The detailed minutes of that meeting have been preserved by successive German governments. Here is a copy of those minutes, in which the Nazis issued precise instructions on how to carry out the extermination of the Jews. Is this a lie?" Yes, it's possible the document is "a lie." According to Francis Nicosia, U. of Vermont distinguished professor of holocaust studies, Jews were domiciled at the Wannsee villa after the war (Allied firebombs left 7 million German civilians homeless; they remained destitute well into the 1950s; as many as 5 million Germans were forced into refugee status and transferred to points east; according to James Bacque, approx. 60% of those transferees died). 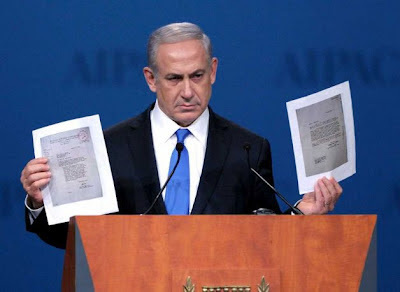 Allegations have been made that the so-called Wannsee Protocol --the document Bibi brandished-- is composed in stilted German that misuses idioms and contains anachronisms. iow, the document does not pass the historian's test of authenticity. That it was typed on machines matching those at Wannsee on stationary available at Wannsee is less remarkable when one considers that Jews lived at Wannsee for a year or more immediately after the war. Frankly, I don't believe litigating Nazi responsibility for the Holocaust has any place here. The idea that conspiratorial "Jews [who] lived at Wannsee" following the war fabricated documentation demonstrating Nazi determination to engage in explicit genocide is not only unconvincing, I find it deeply offensive. Nima, Thanks for posting the comment, even tho you found it "deeply offensive." I would like to know what you find "offensive" about exploring the actual facts of the wars in Europe 1914-1945. I raise the issue, and will continue to do so, because Netanyahu has made the comparison of Iran to Germany. I think he should be taken seriously when he makes such statements, just as he insists that, i.e. Obama should not appease [Chamberlain anyone?] Iran when Ahmadinejad says "Israel should be wiped off the map." Both sides of the equation should be studied exhaustively, and all of the variables tested as to their accuracy. At stake is not a few points on an SAT or closing the dramatic arc on 'Numbers.' What is at stake is the life or death and devastation of 73 million Iranians and their culture. Francis Bacon said that relying on flawed information (such as that based on propagandized notions not objective observation) may get one to a destination more quickly, but it will be the wrong destination. In my view, based on my understanding of Bacon, the sanction against thoroughly researching, from all perspectives, Hitler, Germany, Nazism, and the people who were killed in those wars and how they were killed, is one of the greatest tragedies, and errors, of the age.